Although depicted all of his horseracing scenes in France, the sport itself did not originate there. England is the original home of horseracing, the pastime that became known as “the sport of kings” . 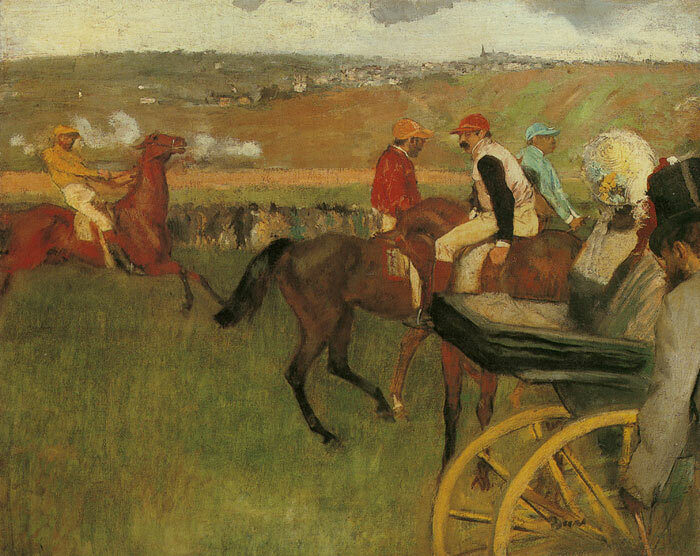 Several of Degas’ early paintings are said to depict, or to be heavily influenced by, the famous track at Longchamp at the Bois de Boulogne Degas was famous for his calculated painting style, and he often went to Longchamp, or other tracks like it, to sketch the animal he revered so greatly as a creature of antiquity. In 1826 France established its first jockey club, the French Jockey Club .This founding would prove to be vitally important for both horseracing in France as well as for Degas’ art. The Club greatly promoted the importance and popularity of racing, but it also and all the ideals associated with it, such as the prominence and skill of the jockey and his ability to control the wild horse. This control was a huge element of racing, and for almost all of the “gentlemen jockeys” in the French Jockey Club and other clubs like it, it was impossible. Moreover, this troubled relationship and struggle for control is exactly what Degas’ depicted in his painting At the Races, Gentlemen Jockeys . SPECIAL NOTE : The painter will make the reproduction as close to the original oil painting as possible. If you want your painting to alter from this likeness, please email us and " At the Races, Gentlemen Jockeys, c.1877-1880 " will be reproduced according to your special requirements.